Photoshopping files isn’t as easy as you think. It takes skill & a very keen eye to be able to Photoshop images correctly. Photoshopping isn‘t just about making images look good. With Photoshop Jett Print can erase things from images, add things to images, etch around shapes, add layers, adjust the colours to make them brighter or darker. We can even completely change the colour space in Photoshop, such as converting a full colour image to black & white or even sepia. Jett Print have mastered Photoshop in all areas, this didn’t happen overnight, it has taken years of training & of course practice! 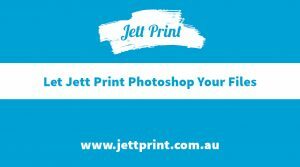 Using Photoshop, Jett Print can rotate, crop, trim & straighten your images without the images looking like they have been worked on or photoshopped. We can add special effects & filters using Photoshop too. Jett Print can retouch your photos, from a simple red eye removal to the improvement of skin tone. Photoshop is a great program to help reshape bodies, remove wrinkles or blemished & even whiten teeth. Jett Print Photoshop skills also encompass the ability to completely change backgrounds in images you supply and add or change any element you like! 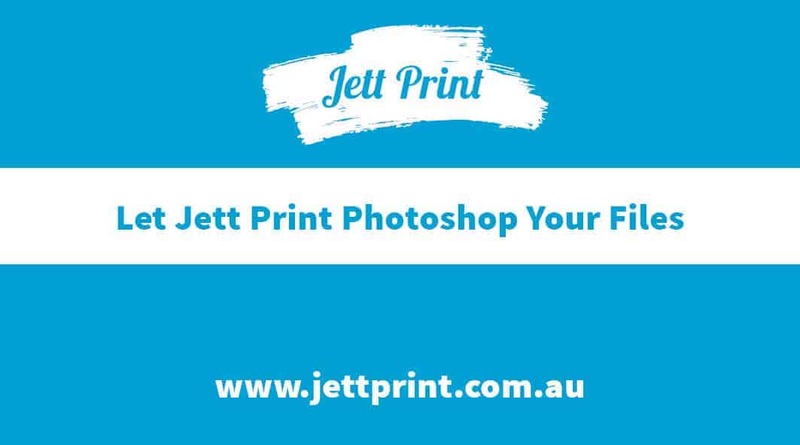 Jett Print offer you a one of a kind design service, no fuss online printing, friendly customer service and a quality guarantee. To view our entire range of printed products and services click here. We design, print and deliver it FAST, Australia wide! You can request a sample pack of some our products so you can see the Jett Print quality for yourself. If you have any questions about our Online Printing Services, Graphic or Website Design services, please email us. We have the design & printing solutions for any budget and we deliver to anywhere in Australia, including Tweed Coast (Tweed Heads), Gold Coast, Brisbane, Northern Rivers (Byron Bay) & The Sunshine Coast.